A few weeks ago, I was in New York City to meet with Mallory Rubin and Ben Glicksman, the college football editors at SI.com. I had an idea for a Rose Bowl story. Earlier this season, I wrote a preview of the Stanford Oregon game based on statistics for drives when quarterbacks Marcus Mariota and Kevin Hogan had played. (Oregon’s Mariota would often be pulled when the Ducks built a huge lead; Stanford coach Shaw only had the sense to start Hogan late in the season.) I thought a similar analysis might be useful for the Rose Bowl. Hogan has now been Stanford’s quarterback for 5 games, and Wisconsin has shuffled through 3 quarterbacks this season. When I sent them the numbers early last week, they liked the analysis but thought it overlapped too much with Stewart Mandel’s excellent article on Hogan. They suggested I base the preview on Wisconsin. It was not the feedback I was looking for on Christmas day. 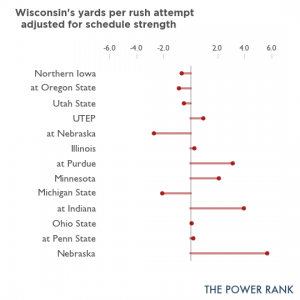 But it did prompt me to look at something I had been interested in all season: what happened to Wisconsin’s offensive line? The traditional strength of the Badgers had played so poorly the first two games of the season that their position coach was fired after two games on the job. 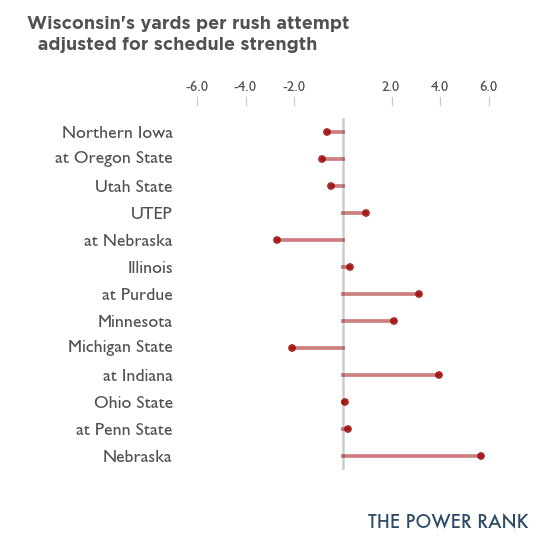 The analysis of Wisconsin’s rush offense became the center of my analysis of their offense. To read the full article, click here.